▲ Viewership ratings of more than 40%, do you expect it to be so popular? – When reading the script outline I guessed the ratings to be between 15% to 20%, totally did not expect it to be so high. Recently, historical drama is divided into fusion drama that is liked by those around 10 to 20 plus years old, and traditional drama that is liked by those around 40 to 50 plus years old. The original novel and the power of characters’ personalities of this drama are distinctive. At first judgment, as long as following the life of the lead characters, it may be able to attract the attention of viewers from 10 to 60 years old. But from the beginning, the scenes of child actors are a lot, so have not dared to put down the tense mood. Recently, even the drama invited the A-class stars, the ratings are also an unknown number, not to mention the 6 episodes starred by child actors, so at that time it would be considered as an adventure. ▲ The child actors have become popular, any secrets when selecting actors? – When choosing the child actors for the first time, want to look for child actors who have the same feeling with the main characters in the drama. Generally the effect served by child actors in drama is to play the childhood time of main characters, showing cuteness or unlucky precursor. But the child actors in this drama has to be around the age of 10, but have to has similar feeling of the adult world, and also must have innocent side of children. And also must be player-class skilled-actors. The first confirmation is Lee Hwon (childhood) – Yeo Jin Goo and Yeon Woo (childhood) – Kim Yoo Jung. Followed by Princess Min Hwa (childhood) – Jin Ji Hee. The role of Prince Yang Myung at childhood must have the strength of highly competent acting. If saying the focus of Hwon is on the personality, then Yang Myung should serve the effect of been a creative force. I watched the TV series previously shot by Lee Min Ho, I feel very comfortable. But his management company refused me because hearing that we want to recruit child actor. Later, I directly sent the script to him, after reading, he decided to star in the drama. ▲ Yeom and Woon have made use of newcomers. – When not yet finding suitable young actors for Yeom and Woon, director Jo euphemistically mentioned, “You may want to take a look at the kids of ZE:A (Children of Empire).” At first look I noticed Lim Siwan. At that time, he never acted before. So I asked him to prepare to see how it goes. Later, he was confirmed at the third meeting. Woon (childhood) – Lee Won Geun is found within the biography profiles sent by management agency of Lee Byung Hun. Although it’s on the last of the printouts, but I feel good, so I asked about it, and the reply was that he was a rookie, and yet to officially has a profile of filming. Indeed a bit inadequate in acting. The result was that he was confirmed at third meeting after his tireless working to improve. ▲ Young Hwon Yeo Jin Goo said that director Kim Do Hoon is obsessed with the role of the Hwon. – Ha ha, he said so? Although Yeo Jin Goo and Kim Yoo Jung are skilled actors with acting experience, but they have been playing the role of similar level, that this also becomes their shortcomings. Hwon and Yeon Woo are crown prince and daughter of high-ranking official, in current era, it’s equivalent to son and daughter of chaebol family. Have to perform a variety of emotions, but both said they like to act in shouting loudly, or act the “strong,” so problem arose when performing the delicate emotions. A month before broadcast, called up two of them, and gave them training about 2-3 times a week. ▲ Whether it’s Yeo Jin Goo or Kim Soo Hyun, aren’t they performed the role of Hwon beyond imagination. – Ah, very satisfied. Really want to portray the role of Hwon perfectly. The role of Hwon has to show that hurt suffered during childhood as a ruler and other human face. If the Hwon who is still a kid is the combination of innocent, constantly changing and naughty, then adult Hwon is a cold, distancing character. Regarding the acting and personality I discussed a lot with Yeo Jin Goo. On the contrary I did not discuss much with Kim Soo Hyun. But Kim Soo Hyun has already sufficiently prepared before filming started. Instead, the preparation is overly done, will in which I erased some part. ▲ On the contrary, the acting of heroine Han Ga In was accused as no good by audience in the beginning. – She herself was also very hard at the beginning of the broadcast. Has also suffered a lot of damage because of the saying of lacking in acting. But you could also see the aura of been the lead actress on debut. Because she wanted to break through from the previous her, I also worked hard to help her. After the she knew that she is the crown princess in the drama, in the angry scene, I think she made a breakthrough. At the time several days before shooting, I have talked with Han Ga In a lot, telling her to abandon everything, if there is any knot in her heart, then shout it out. That scene is beyond my expectations. Han Ga In is very eager on the acting. This drama may become the process of growth as an actor. 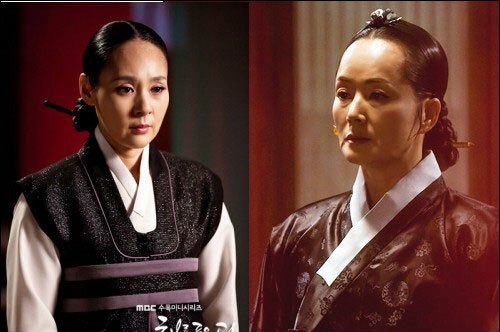 ▲ Jun Mi Sun who plays the role of state shaman and Kim Young Ae who plays the role of Great Empress Dowager used to work together with you in Royal Family. – The two were cooperated with me for the first time in Royal Family. After reading the script, I felt that it must be them. Jun Mi Sun also wanted to play such role that is more tough. When playing the role in-law of chaebol for the first time in Royal Family, I have felt it’s good. No need to mention about teacher Kim Young Ae, kind of well deserved reputation.